Precision styling for finer hair. 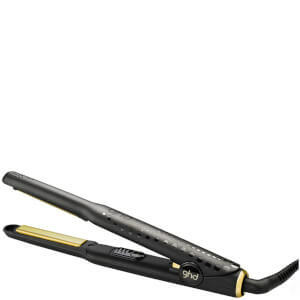 This ghd V Gold Mini Styler has narrower and smoother glimmering gold plates that glide through hair quicker and easier, allowing straightening from root to tip. The ceramic heaters and sleeker contoured plates give a professional finish, helping you achieve any style you desire, including perfect curls and waves. No need for cooling, it comes complete with a protective plate guard, which means you can pack up instantly and don't have to worry about damaging surfaces after styling. The styler features an automatic sleep mode, which kicks in when it is inactive for 30 minutes. Its universal voltage is perfect for travelling the world. E.N.